As the papal entourage prepares to leave the mountains and head for the Alban Hills, there was an overlooked story. It seems that B16 didn't know the names of the mountains, and he was intrigued to learn them. Enter Mattia Clusaz, the son of a local farmer. 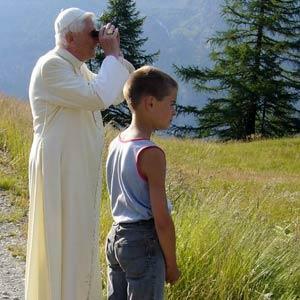 The 10 year-old Mattia told the Pope the names of the mountains and, according to the Italian Bishops' daily Avvenire, Ratzinger followed along with his binoculars. The coverage in the Italian press seems to imply that the moment was captured by none other than Joaquin Navarro-Valls, the portavoce of the Holy See. And in another fascinating touch, the Pope seemed to be wearing something other than the traditional John Paul II moccasins.... It almost seems as if he's donned Doc Marten's boots. Hey, he wears Serengeti sunglasses, so anything is possible, right? 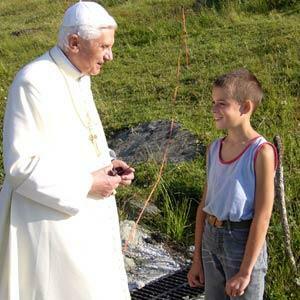 Whatever the case, we've gotten a good sense of how Ratzinger likes to relax -- loves the piano, his reading, contemplation, good discussion and bringing the work with him, albeit at a more leisurely pace. And he was so relaxed in what he called "paradise" that he gave two press conferences and solidified his preference for a baseball cap. It might just be the most productive, and consequential, vacation of any kind in recent memory.